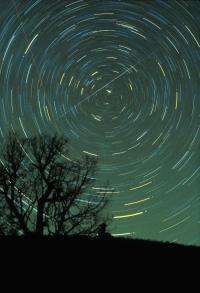 (PhysOrg.com) -- Whether you're watching from a downtown area or the dark countryside, here are some tips to help you enjoy these celestial shows of shooting stars. Those streaks of light are really caused by tiny specks of comet-stuff hitting Earth's atmosphere at very high speed and disintegrating in flashes of light. Note: While the shower peaks an hour or two before dawn, the year's closest and largest full moon will be out all night, resulting in a moonlit sky that will wash out all but the brightest meteors. Meteor watchers in the Southern Hemisphere stand the best chance of seeing any meteors. Notes: It's not a good year for the Delta Aquarids -- light from the August full moon make them nearly impossible to see. Notes: Moonlight won't be as big a problem as last year, as its waning crescent won't rise until after midnight, and the shower peaks from about 10-11 p.m. local on the night of Aug. 12. Note: The Geminids are typically one of the best, and most reliable, of the annual meteor showers. This year's peak falls perfectly with a new moon, guaranteeing a dark sky for the show in the nights on either side of the peak date. This shower is considered one of the best opportunities for younger viewers because the show gets going around 9 or 10 p.m.